I’m a huge fan of the show Mad Men for a lot of reasons. The weekly drama attempts to reveal what Manhattan advertising agencies were like in the 1960's with complex characters and engaging story lines while also keeping the plot relevant to the social issues of that time period. 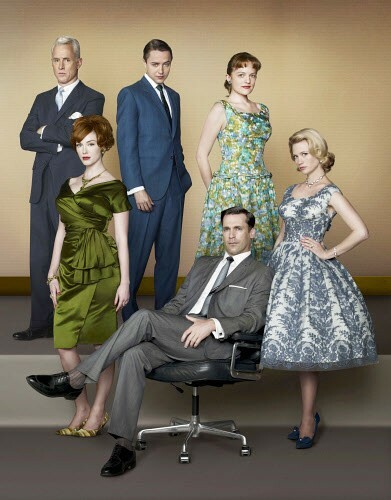 But outside of any true connection I might feel with the show’s characters, my obsession with Mad Men stems from a love of the decade’s fashion. So you can imagine how thrilled I was to find out that “wardrobe wonder woman” Janie Bryant, a vintage lover who dresses the characters for every episode, shops The Salvation Army thrift stores for fur, leather and other finds. Just take that in for a second. The beautiful characters of Mad Men you're watching each week are quite possibly decked out in clothes from The Salvation Army! Ok, I might be more excited than you. Offering fashion do’s and vintage tips in her interview with fashion site Refinery29, she said, “If you’re ever in New York, make sure to stop by the Salvation Army on 46th between 11th and 12th streets. Three times a year they have a fur and leather sale, and you can get the most amazing things. Those are definitely my best vintage finds.” Check out the full interview here. If you haven’t seen the show, the women of Mad Men are usually adorned in colorful, form-fitting dresses, high heels and small handbags. Actually, the bags are unreasonably small. I digress. To get the Mad Men look but avoid dating yourself, Janie recommends pairing period pieces with contemporary style. For instance, a ruffled blouse from the 60’s would pair well with today’s skinny jean trend. Janie’s quote above is exactly right. You literally never know what great period pieces you might find at a single Salvation Army store. And since vintage is always in, we suggest you find out for yourself and visit your local Salvation Army. It might take some scavenging, but we know you’ll walk out the door with at least one great piece at a shockingly good price. P.S. Find out how your purchases and donations help men and women in need of alcohol and drug rehabilitation: www.satruck.org.